Halloween is in the air! The internet teems with spookiness. Goblins and ghouls frolic freely. 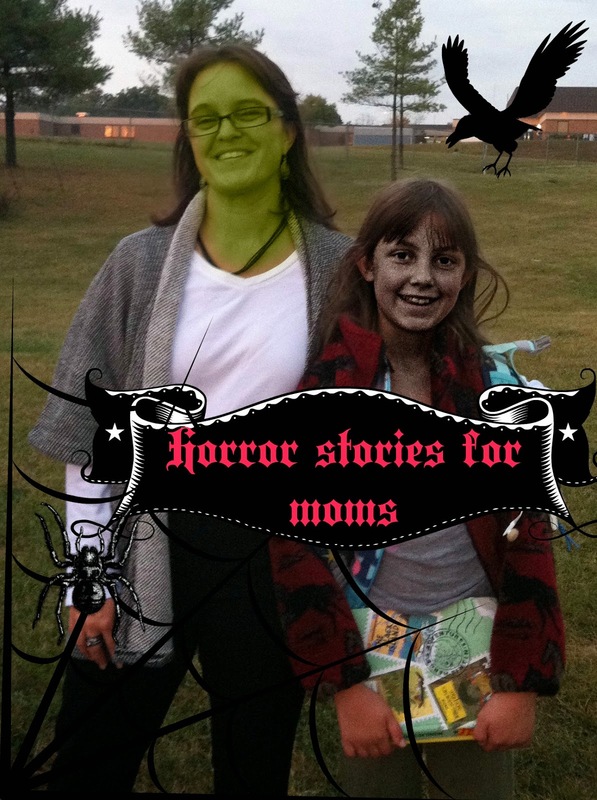 And today I have several horror stories for moms. Read on...if you dare!! Janet was working quietly at her desk. She had about an hour to finish the spreadsheet before it was due to her boss. She'd had a few issues with the formulas, but she had gotten them all ironed out and was cruising along inputting all the data that she had from the last year. Jeff waved as he walked past her cubicle. Thankfully he didn't stop to talk, as he sometimes did. She was in a groove and didn't want to be interrupted. Then the phone on her desk rang. She glanced at it briefly and kept working. "Let them leave a message," she thought as she continued typing. But then she heard a strange sound coming from behind her. She tried to keep working, but the sound persisted. A sinking feeling came over her as she recognized the sound. "No! Please, no!" she moaned as she turned around to discover the source of the noise. Maggie had the day off. Her office was being fumigated and the employees had all been sent home. The kids still had school and her husband was at work, so Maggie had plans to indulge herself a bit. There was a new bestseller she'd managed to be first in line for at the library, a nice, cozy pair of sweatpants, and a soothing mug of hot chocolate to drink in bed. She even had a new crossword puzzle book if she felt like a bit of intellectual stimulation. The day dragged past and Maggie was about halfway through her book when she finished her hot chocolate. As she got up to refill her mug, she dropped her pencil for her crossword puzzles. Not wanting to forget it was there, she got down on all fours to retrieve it from where it had rolled under her bed. Diane and Jack had finally gotten the chance to get out for a night on the town. The stars had aligned such that the babysitter was free, there was money in the bank, and no one was too exhausted to go out. It had been such a long time since they'd managed to get away and they were determined to live it up. First they had dinner at a nice restaurant. No one spilled food under the table, Diane didn't have to cut up any food but her own, and they even splurged on a dessert that they only had to share with each other. After a sappy romantic comedy at the movie theater, they headed home. They were laughing as they walked in the front door and saw the babysitter sitting calmly on the couch reading a book. The dishes were done, food from dinner was put away, and there wasn't a single sound in the house. It was almost too good to be true! "How'd it go?" Diane asked. "It went really well actually. The kids seemed a little extra tired and they went to bed a bit early. To be honest, it was a little scary how easily they went to bed." Diane's stomach gave a little flip as the sitter described her evening. "They went to bed willingly? That's odd. I should go check on them." She walked slowly with a sense of dread creeping over her. It was a regular Sunday morning for the Peterson family. The older kids were sitting in the pew alternating between paying attention and coloring on the church bulletin. The youngest was on the floor playing with the kneeler. At least everyone was relatively quiet and Brenda could try and pay attention. Little Billy bumped into her leg as he was spinning around on the floor. She held out her arms to him and he willingly climbed up into her lap and threw his arms around her neck. She snuggled into his neck and gave him a little squeeze. And then she noticed his chin bumping her shoulder at regular intervals. It took her a minute to realize that he was chewing on something. And then only a second longer to realize it was gum he was chewing. "That's odd. He's not old enough to chew gum." She thought idly. And then it hit her! "Eeeeew! Billy, what are you chewing?" she hissed into his ear. Over the years I have come to the conclusion that my ability to be scared/surprised/shocked decreases relative to the number of children I have. Any other moms out there who share my conclusion? These are some of Mom's worst nightmares come true! ;) Hilarious post, Rabia, and perfect for Halloween! Yes, you got me. 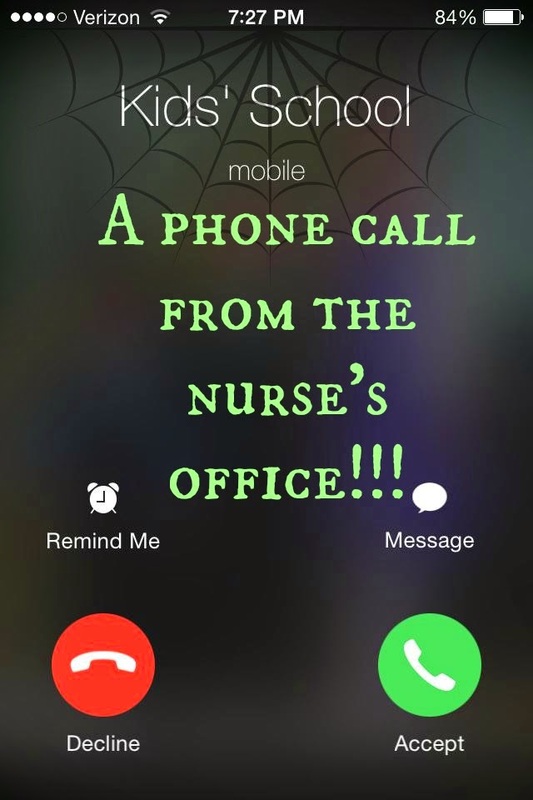 All of these make a mom's nightmares during the day and night! This is amazing, Rabia! I love the hidden content! The long forgotten sippy cup is TERRIFYING! I hear ya! These things don't really faze me much either, but they sure were fun to write! I cracked myself up a time or two while writing this one! Most of them are loosely based on real life too. Spooky! Don't they, though! Thanks for stopping by! That was the scariest one for me. But when I was writing it, I realized we don't even have sippy cups anymore. I had to borrow a picture from a friend! 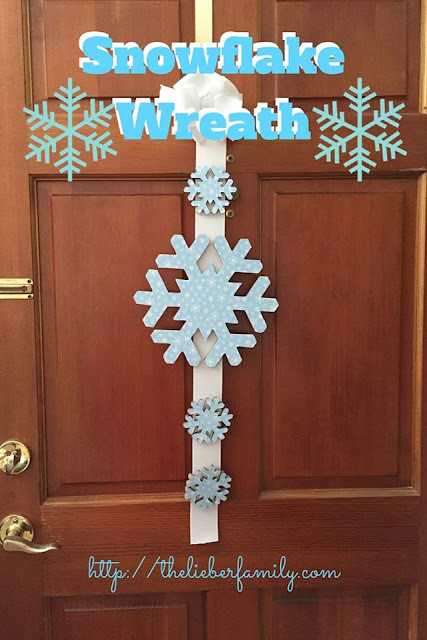 Love this, the hidden content is the best! I found a sippy cup in my car once that I am sure was years old! The milk was not curdled, but hardened and some freaky colors! haha.. you have outdone yourself! I can't stand the dreaded nurse's office call. It happened NOT AT ALL during two years of preschool. A week into kindergarten? FEVER! I remember these days oh-so-well. Now I get the dreaded text "Mom, I shattered my phone's screen." Oy. 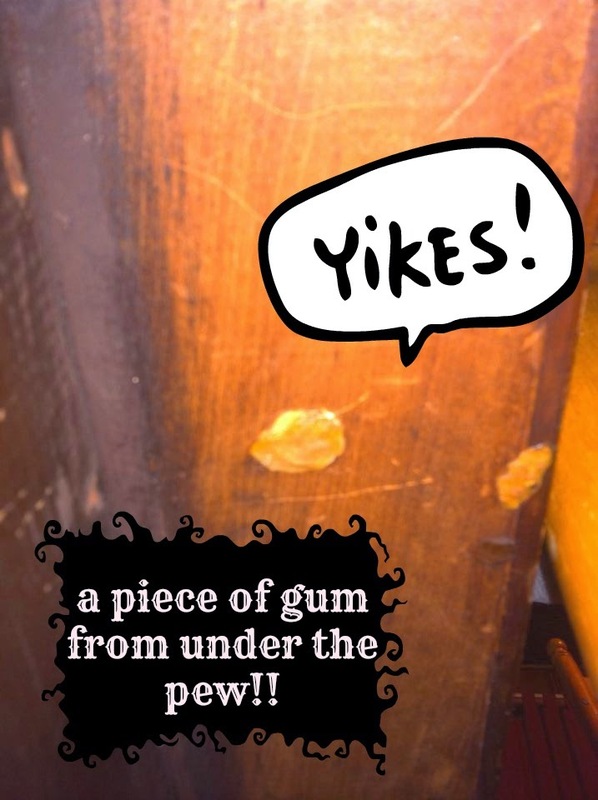 Ugh, that piece of gum under the pew!!! LOL. 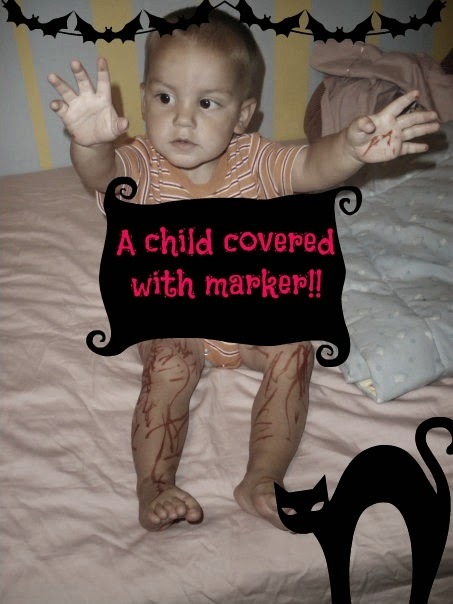 And the child covered with marker is "horrifying" hahaha. I once found Reiko with markers all over his legs one time! Hahaha the last one is definitely my favorite - hasn't happened to us *yet* but I remember John Paul trying to pry gum off of a bench to eat it when he was a toddler! Ewww! I've found my kids eating things they found in their car seats before! Yuck! I had fun figuring out how to write it this way! 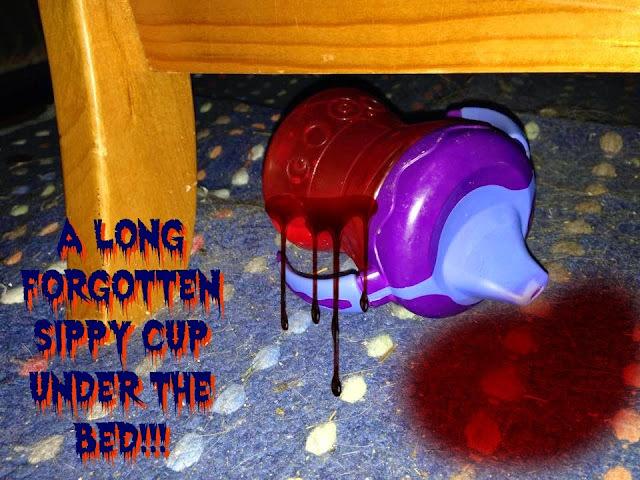 And I'm so glad we don't do sippy cups anymore! Thanks Tamara! I had a lot of fun with this one! Oh no! I'm afraid to get my kids phones because they don't always take care of things well. This was Henry when he was about 2. I showed the kids this picture and they cracked up!! He doesn't remember doing it. Sadly, this one is pretty close to true. I think I caught the gum before it went in the mouth. At least that's how I'm choosing to remember it!